That ebbing and flowing you hear as you lie on your towel under an umbrella? It de-stimulates your brain. 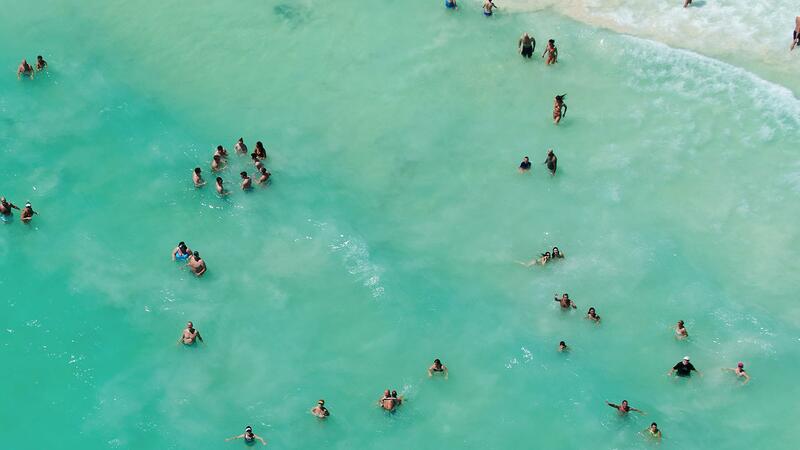 There’s nothing quite as synonymous with summer as the beach — and we’ve got good news for those who flock to the surf and sand as soon as work lets out on Friday afternoon. Research finds that spending time by the ocean is pretty good for your wellbeing. In fact, according to an analysis of English census data published in the journal Health Place, those who live by the coast report better physical and mental health than those who don’t. And in a study published in the Journal of Coastal Zone Management, participants who live in homes with ocean views report feeling calmer than those without them. So, it makes sense then that Hawaii has earned the ranking of happiest state in the U.S. by the annual Gallup poll six times since 2008, doesn’t it? When it comes to why, exactly, the beach gets you feeling all Zen, there are a few factors at play, says Richard Shuster, PsyD, clinical psychologist and host of The Daily Helping podcast. “The color blue has been found by an overwhelming amount of people to be associated with feelings of calm and peace,” says Shuster. “Staring at the ocean actually changes our brain waves’ frequency and puts us into a mild meditative state.” A study published in the American Association for the Advancement of Science’s journal even found that blue is associated with a boost of creativity. The smell of the ocean breeze contributes to your soothed state, which may have something to do with the negative ions in the air that you’re breathing in. Plus,that consistent ebbing and flowing you hear as you lie on your towel under an umbrella? “It kind of de-stimulates our brains,” says Shuster. The noises — coupled with the visuals — activate your parasympathetic nervous system, which is “responsible for slowing us down and allowing us to relax and feel more engaged,” says Sally Nazari, PsyD, owner of Chrysalis Psychological Services and host of the podcast Beyond the Couch. The smell of the ocean breeze also contributes to your soothed state, which may have something to do with the negative ions in the air that you’re breathing in. These oxygen atoms have an extra electron and occur in places like waterfalls and the ocean, says Shuster. A study published in the Journal of Alternative Complementary Medicine suggests that negative ion therapy could be used to treat symptoms of seasonal affective disorder. Finally, the simple act of touching the sand makes you feel all fuzzy. “The physical sensation of putting your feet in warm sand causes people to relax,” says Shuster. Don Draper’s beach-induced eureka moment on the California coast. As much as we’d happily set up residence beachside on a Hawaiian island, you don’t actually have to live by the water to reap the benefits. It’s all about taking advantage of the time you spend there by practicing mindfulness. Mindfulness has tons of mental health benefits including stress relief,says Nazari. A study published in the journal Psychiatry Researchfound that the brains of those who completed an eight-week mediation course changed in a few ways. For starters, the area of the brain responsible for stress shrunk in size. “This means that we become more resilient to handling stress and that stress doesn’t rattle us as much,” explains Nazari. On the flip side, the parts of the brain responsible for memory, reasoning and empathy grew. An easier time thinking, focusing and connecting? That’s a pretty sweet deal — and just might make for a more productive Monday morning. 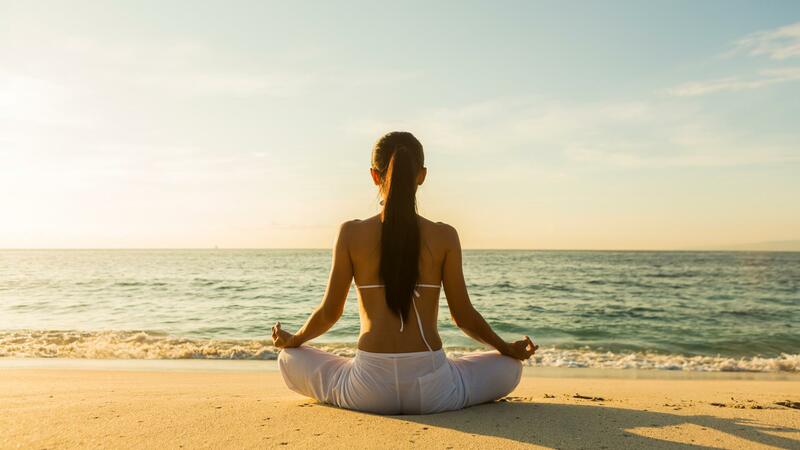 Staring at the ocean actually changes our brain waves’ frequency and puts us into a mild meditative state. Above all, be aware of your senses. “Focus on how your body feels warm from the rays of the sun, focus on what it feels like to have your feet in the sand, breathe deep and smell the ocean air,” says Shuster. Oh, and before we forget the “body” part of the whole “mind-body connection” — we give you full permission to go hog wild with sunscreen. 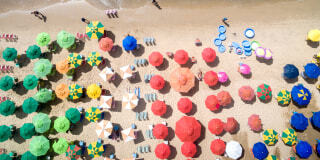 “Sunscreen is a critical tool for helping beachgoers avoid sunburn, and it reduces the risk of developing skin cancer,” says Tyler Hollmig, MD, dermatologist and director of laser and aesthetic dermatology at Stanford Health Care. Skin cancer is no joke: According to the American Academy of Dermatology, experts estimate that one in five Americans will develop the disease in their lifetime. Hollmig points out that most people don’t use enough sunscreen when they hit the sand. Use an SPF of 30 or higher and apply an ounce (aka a shot glass full) from head to toe 15 minutes before heading outside. “No sunscreen is truly waterproof,” he says — which is why you need to reapply every two hours or ASAP after a dip in the water. Now, get out there and soak up all that vitamin sea.